No matter what you may have been led to believe, going deep beneath the ocean’s surface is not just for Navy personnel. 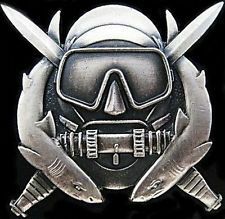 There are many in the United States Army who dive on a regular basis….they have badges to prove it. In today’s post, I am going to educate you on Army Special Operations Diver Badges: what you should know about them. I am honorably discharged from the United States Army, but I did not earn any of these badges. The information I am giving you has been discovered through research and study. If you find any discrepancies, please leave a comment and set me straight. If you love water and you love the Army, you do not have to go to the Navy to get a diving job. The 12D MOS is for divers. Special Operations in the United States Army can entail circumstances that call for a diversity of talents. You may need to free-fall from a plane and open your parachute close to the ground, but that ground may be the ocean, and you need to get to a submarine below the surface. The designs of these badges are quite similar, with the Supervisor badge having a star in the middle of it. The design is a stealth diving helmet surrounded by two sharks. Behind are two Fairbairn-Sykes daggers (World War II fighting knives) in the saltire cross fashion. To be blunt, this course does not have room for any weakness. When the Army says GO STRONG, they sure mean it when it comes to the diving courses. Before a soldier will even go to the primary course, the Army has found that “weeding out” possible drop outs was wise. For two to three weeks, the soldier will be involved in a pre-scuba course which tests the soldier and builds them in strength and endurance. In a simple swimming pool, you will swim for long distances, practice water confidence drills, and other drills you will need to be able to endure the main course. If you pass this testing you will then be on your way to Fleming Key and The Key West Naval Air Station for the CDQC (Special Forces Combat Diver Qualification Course). Classroom instruction that will show you subjects such as: diving tables, marine life dangers, repairing regulators, currents & tides, chamber pressure testing, CPR, and much more. Note taking is a must, as you will be tested. Start in pool with tying knots underwater, dive procedures and inspection, ditching equipment, and more. Maritime duties and operations. You will learn about bundle rigging, submarine lock-ins and lock-outs, recovery operations, ship bottom searches, infiltration, deep diving, and more. Open ocean swims. You will swim for long distances in the ocean both on top and timed sub-surface swims. Closed circuit swims using a re-breather rigging. This is just a partial look at what you will endure. On the last days of the course, you will conclude with a Field Training Exercise and an end examination. If you pass all of these requirements, you will be presented with your Special Operations Diver Badge. As a supervisor, your job will be in planning, coordinating and supervising Special Operation’s dives. There is a three week long course for this badge. The subject matter goes deeper into subjects you learned in the basic course. The primary goal is to have the supervisor familiar with any and all types of diving equipment. They must also understand diving physics, and subjects like tides and currents at an expert level. It is believed that those seeking the supervisor badge will also have to wear twin air tanks and parachute from a plane with other assorted equipment into a shark DZ. Do you have the guts? No, diving isn’t just a Navy adventure. The Army offers this adventure too, and you can jump from a plane to do it! 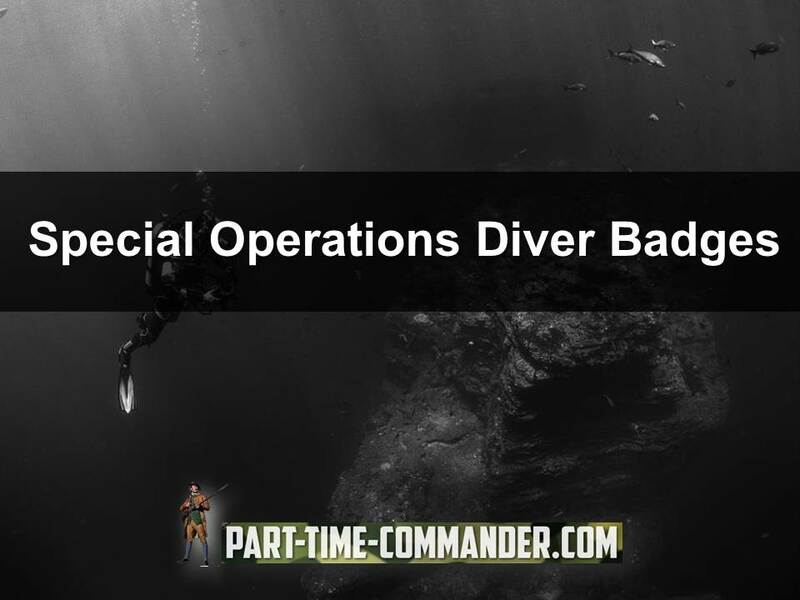 If you have your Special Operations Diver Badge, we would like to hear from you. Tell us more, please! What was the experience like? What tips can you share for someone thinking about attending this course? Just leave a comment below to do so. Awesome. What types of training and testing did you have to go through to earn your Diver’s badge? What was the hardest thing for you personally? This may a shorter post of yours, but it stills packs a punch! Lots of great facts and info. Maybe not the most necessary for someone like me to know, but who knows? It may become useful. Thanks!